In the open-air market here in Santa Cruz, in the semi-tropical center of Bolivia, I’ve seen the dried llama fetuses that one buries in the foundation of a new house to ward off evil. In the center of town, I’ve marveled at the old women who sit on the sidewalk patiently waiting all day for someone to buy one or two of the oranges they’ve put on the blanket in front of them. On my long walks from the rectory I’ve watched shiny new Porsches dodge around burro-powered carts on the highway. A few days ago, on Palm Sunday, I saw little children sitting at the gate of the churchyard selling palms before Mass. Nothing surprises me anymore now that I’ve been here for over a week. So I’m not shocked to see a woman show up for the Good Friday service carrying a long ribbon-like piece of last Sunday’s palm. Then, as people start filling the pews, I notice more and more of these yellow branches appearing. By the start of the service in honor of the Passion and death of our Lord, there are palms in every part of the church. The liturgy begins in silence with the procession of priests and altar servers. In the sanctuary we four priests quietly prostrate ourselves on the floor for a moment as a sign of repentance. Then we stand and the pastor prays the opening oration. Everyone sits down and the readings begin. In the deep faith of the campesinos, the simple country people, religious practices are sometimes a confused mixture of native religion, superstition, and imperfect Christian theology. But when I look out over the crowded church this Good Friday afternoon, their custom of celebrating “Palm Friday” starts to speak powerfully to me. The pious folks who have come back today carrying last Sunday’s palms with them actually show deep insight into the great paradox of Christian life. The bright yellow strips of palm are accusing fingers pointing to a sad truth: we are the same people who greeted Jesus at his triumphal entrance into Jerusalem just five days ago. We recognized the Messiah and sang out in joy, “Hosanna to the Son of David! Blessed is he who comes in the name of the Lord!” We tore branches off of trees and laid them on the road for his donkey to walk on. But that was Sunday. And this is Friday. Today our hands, the same hands that waved the branches in homage, are clenched fists shaking angrily at the pathetic figure crowned with thorns. The same congregation that was Sunday’s welcoming throng has turned into Friday’s bloodthirsty mob. The same voices that sang out, “Hosanna! Hosanna!” last Sunday are shouting, “Crucify him! Crucify him!” this afternoon. After the readings and prayers comes the ancient ceremony of the veneration of the cross. Worshipers stream single-file toward the crucifix to kiss the image of their Savior. Once again, the accusing palms appear here and there in the line. At the end of the service, a procession forms behind a life-size cross that is being carried out of the church and through the streets on a public Way of the Cross. The church empties as the crowd forms a procession to visit fourteen stations that have been placed around the neighborhood. Once again, several yellow palms lift their sharp points upward, looking more and more like accusing fingers all the time as they wave slowly in the wake of the large wooden cross. In the victory celebration in Heaven, all the saints will be carrying palms. The branches will be the sign of our sharing in Christ’s final triumph over sin, over our unfaithfulness and over death itself. The procession has left the church now. A few dozen have stayed behind to go to confession. I walk over and sit on a hard wooden chair in the little open alcove that will be my confessional. The first penitent, a sun-dried old man, shuffles toward me. A well-worn palm branch is clutched in his gnarled brown hand. Will he bring it with him once again, I wonder, when he comes to celebrate on Easter Sunday? Picture yourself in two different crowds. First, you’re standing with hundreds of people lining the road as Jesus enters Jerusalem on Palm Sunday; you’re waving a palm branch and shouting, “Hosanna!” with everyone around you. 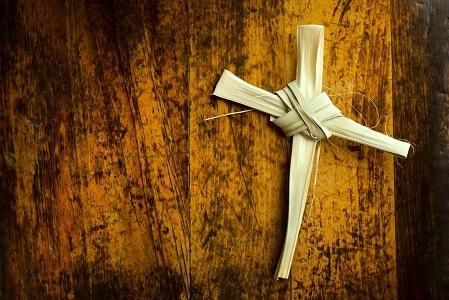 Next, you’re standing at the foot of the cross on Calvary in the crowd that has called for Jesus’s death; in Bolivian style, you’re carrying the very same piece of palm you had with you on Sunday. Do you feel the harsh contrast between the two scenes, and the bitter irony of your situation? When and how do fickleness and unfaithfulness to God tend to play themselves out in your life? Stay on Calvary and pray for a few minutes at the foot of the cross. If this exercise starts to get too depressing, then try this: picture yourself standing with your piece of palm in the throng of white-robed saints in Heaven and shouting with boundless joy, “Salvation to our God, who sits on the throne, and to the Lamb!” The Lamb shed his blood on Calvary for you precisely so that you could stand in this Heavenly throng and wave your palm branch and shout in joyful triumph for all eternity. Try making up a prayer of thanks to the crucified Savior. Pilate said to the Jews, “Behold your king!” They cried out, “Away with him, away with him, crucify him!” Pilate said to them, “Shall I crucify your king?” The chief priests answered, “We have no king but Caesar.” Then he handed him over to them to be crucified. So they took Jesus, and he went out, bearing his own cross, to the place called the place of a skull, which is called in Hebrew Golgotha. There they crucified him, and with him two others, one on either side, and Jesus between them. The third step of humility is that a man submits to his superior in all obedience for the love of God, imitating the Lord of whom the apostle says: He became obedient even to death.